Published November 18, 2015 By Leisa Good This post may contain affiliate links. Regardless, I only recommend sites I've researched and/or used and trust. Is social media a part of your everyday life? Do you consider yourself well-versed in social media? Have you ever considered a work-at-home job in social media? 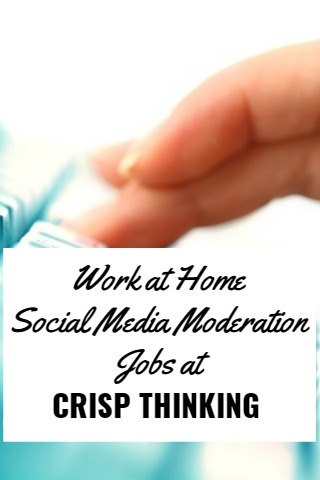 If so, you may be interested in the work at home social media moderator opportunity that Crisp Thinking offers. What Exactly is Crisp Thinking? Crisp Thinking was founded in 2005 by Adam Hildreth, whose goal was to weed out people who were not acting professionally on the Internet and posting things that were not true. His mission then and now was to always protect the client's brand and reputation. To do this, Crisp Thinking (or just Crisp) hires social media moderators to work as independent contractors both in the United States and in the United Kingdom. Crisp offers the client 24/7 coverage with removal of any inappropriate social media content within 15 minutes of posting. Then there are audit trails and reports generated all with the intent of protecting the brand and reputation of the client. What Do the Social Media Moderators Do at Crisp? reviewing and classifying content on all of the major social media channels. escalating any issues outlined by the client. feedback on any emerging trends. providing a daily report summarizing any issues. What Are the Computer and Other Requirements to Work at Crisp Thinking? What Are the Pay and Hours Like at Crisp Thinking? The hours are 24/7, and a minimum of at least 15 hours are required per week. The pay appears to be $10 to $15 USD hourly, paid out every two weeks. There will be a training period of between one to two weeks for this position, but I wasn’t able to find out much more than that. What Do Workers Say About the Job? As of the date of this blog post, Glassdoor only has one review posted. However, it was written by a social media moderator and it's very positive. You can go here to check it out. Have you done any work at home for this company? If so, please feel free to comment below to share your experience with others who may be contemplating applying. How Could an Interested Individual Apply to the Social Media Moderation Position at Crisp Thinking? You can go here to begin the application process. It will look more like a survey than an application, but it is an application. Even if they are not hiring, you can always apply and they can hold on to your application should they be interested in hiring you in the future. Curious About Social Media Work at Home, But Unsure You Want to Work For This Company? Check out this overview of social media jobs from home for more ideas. Get a membership to FlexJobs, the most trusted job board with flexible and remote work that is guaranteed to be scam-free. Get 30 percent off a membership with promo code AFFILPROMO. You will occasionally see social media related work at home jobs posted here. Learn how to go into business for yourself doing social media management, getting clients, and charging what you want. Social Media Management School is a highly-rated resource you can check out for really learning how to do this. I applied using the new link provided here in the comments. I passed the initial multiple choice test with a perfect score. It said if you pass, they will contact you in a week’s time, to be followed with a phone interview. That was about 2 weeks ago and I still haven’t heard anything… I’ve checked my email every day. Are they not hiring? It would be nice to know that before bothering to apply. The application, while not “hard”, *is* time consuming. Feeling disappointed. What’s going on with this application process? I filled out the application last semester (which is via Survey Monkey) and received no confirmation email or further correspondence. I can’t even remember how far back I did the application because there is no email to confirm or a timestamp on the finished application “survey”. This is the most ridiculous manner of asking for applications. Same here. Their survey says they may or may not be hiring, how stupid. They should at least indicate on the survey if they’re actively hiring so people don’t waste their time. I assume that’s per hour, paid out every two weeks. Is it $10-$15 per hour, paid out every two weeks? No where near $10 a hour. More like $2-3. Not worth the effort. I’m going to apply. Is it entry level? This is the trouble I’m running into with lots of WAH jobs. My current jon is not related to many WAH positions. Any advice?